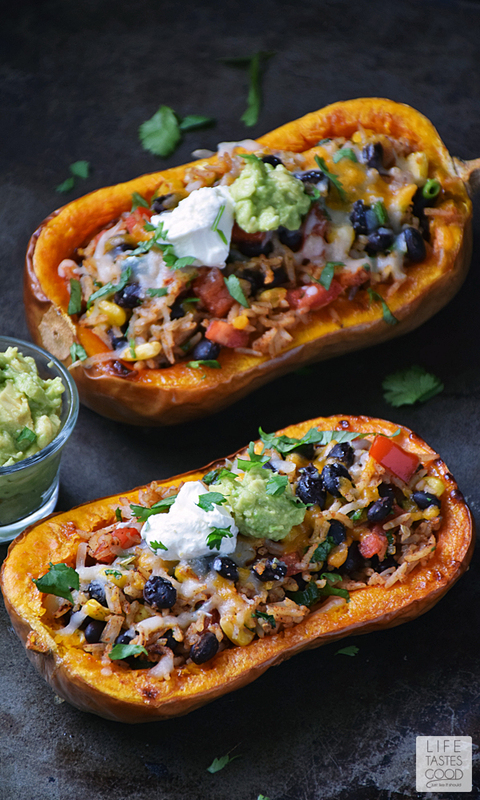 Stuffed Butternut Squash is a meatless meal packed full of fresh flavors inspired by Mexican cuisine. 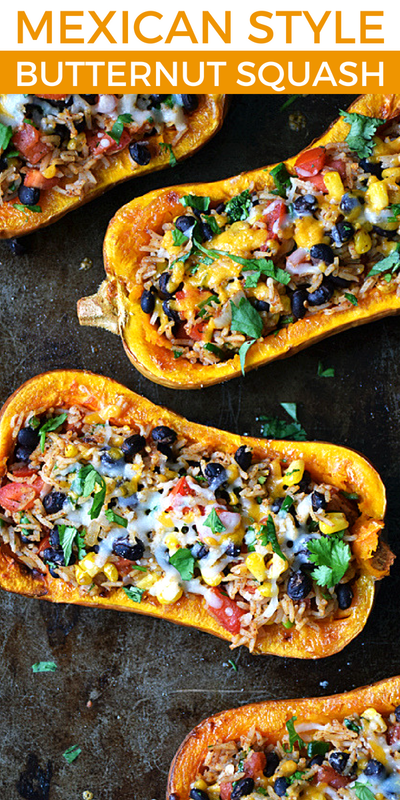 This Stuffed Butternut Squash recipe comes in a handy bowl you can eat too! Disclosure: Life Tastes Good is a participant in the Amazon Services LLC Associates Program, an affiliate advertising program. 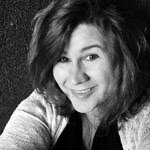 Please note: This post may contain affiliate links to products I use and love. I earn a small commission, at no extra cost to you, to help with blog expenses when you make a purchase through an affiliate link. Thank you for your support! For the most part, we are meat eaters, Don doesn't typically feel like it's a complete meal without some sort of meat in the equation, but I like to mix things up from time to time and throw in some meatless meals. Usually he complains and asks 'is this all?' or 'where's the main course?' It's not that we don't LOVE vegetables. We absolutely love vegetables and typically our meal will consist of a big salad or lots of steamed fresh vegetables with a small piece of protein and, if he's lucky, I'll add in a starch. When I served up this Stuffed Butternut Squash I didn't mention it was a meatless meal and Don didn't miss it one bit! The beans, rice, vegetables, and cheese all combined to create a satisfying meal with a complex mix of flavors to rival any of our meaty main dishes! Scroll down past my photo tutorial to access the ingredients and directions all in one place, if you prefer. Thanks! Scrub the outside of the squash clean and cut each in half down the middle from the stem to the root end. Scoop out the seeds and place on a baking sheet so the inside of the squash is facing up. 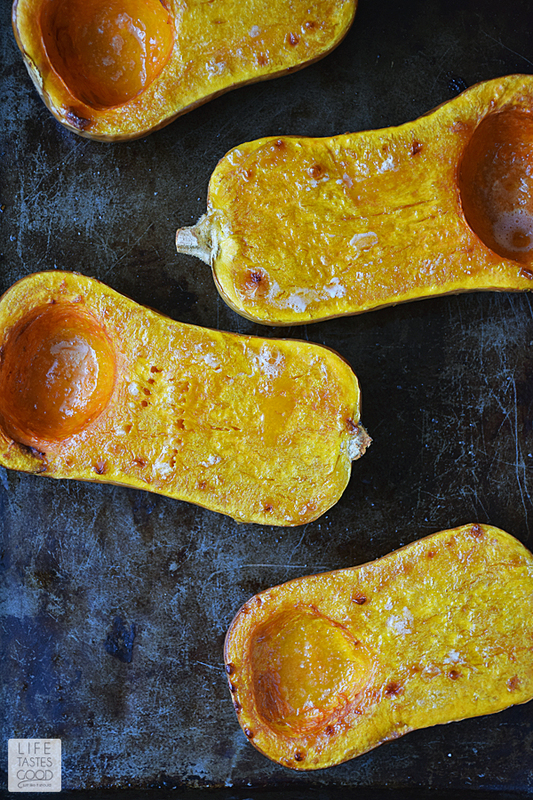 Melt 1 tablespoon unsalted butter and brush a little on each squash. Sprinkle each squash with a pinch of kosher salt and roast in the oven for 50-60 minutes or until very soft when pierced with a fork. Melt 2 tablespoons unsalted butter in a large skillet and add 1 cup Basmati rice. Cook the rice until lightly toasted and add 2 cups of broth. I use chicken broth, but vegetable broth works fine if you prefer. Bring to a boil, cover, and reduce heat to low. Simmer for 15-20 minutes until most of the water is absorbed. Remove from heat and rest for 5-10 minutes, covered. 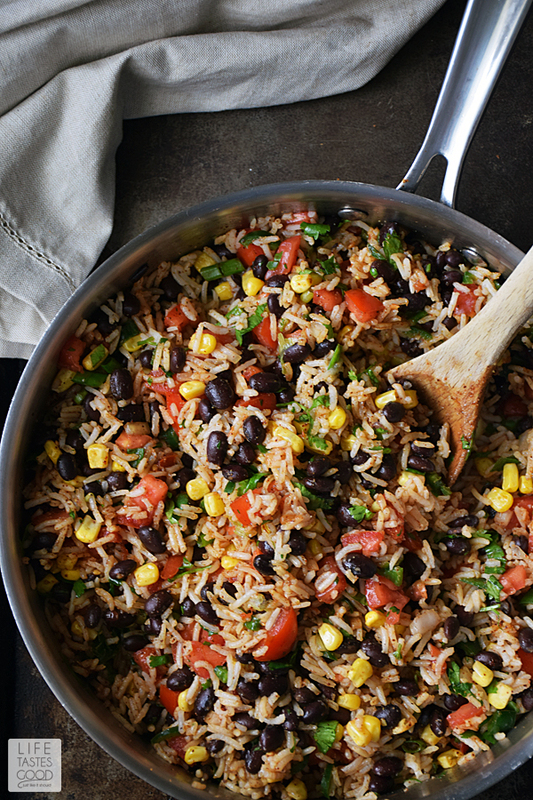 Fluff rice with a fork and add 1/2 cup cheddar cheese, black beans, 2 cups salsa, 1 cup corn kernals, 1/4 cup freshly chopped cilantro, 1 teaspoon cumin, 1 teaspoon chili powder, and 1 teaspoon garlic powder. Mix that all up and give it a taste. Add salt and pepper to your liking. Reserve until ready to stuff squash. Scoop out the inside, leaving a nice border all the way around. I use the open end as a guide and scoop out enough squash to make it even end to end. 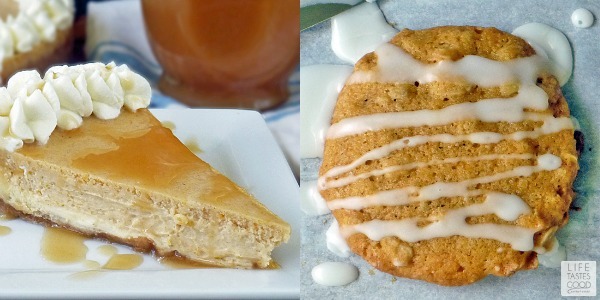 Reserve the squash you scoop out to make a wonderful dessert such as my Butternut Cheesecake or Oatmeal Butternut Squash Cookies. and bake in the oven until the cheese is melted and everything is heated through, about 15 minutes. Remove from oven and serve with sour cream and my homemade Simple Guacamole. Enjoy! 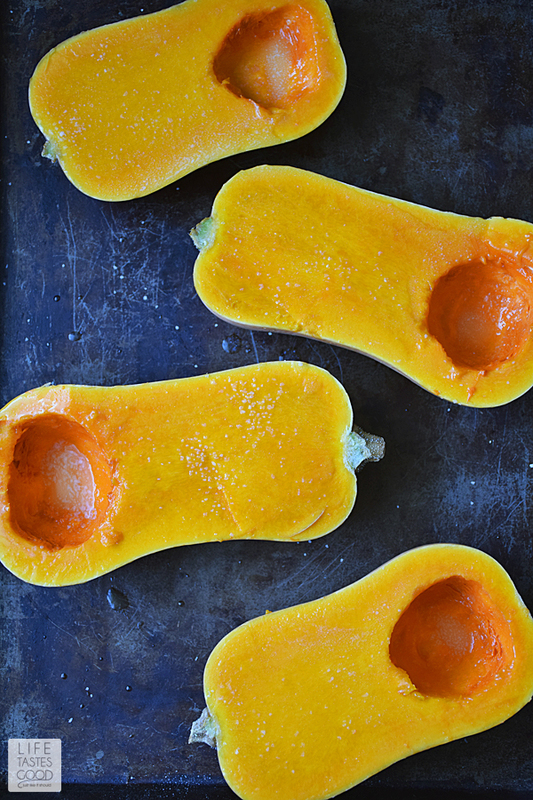 To make the butternut squash bowls, preheat the oven to 400°F. Scrub the outside of the squash clean and cut each in half down the middle from the stem to the root end. Scoop out the seeds and place on a baking sheet so the inside of the squash is facing up. 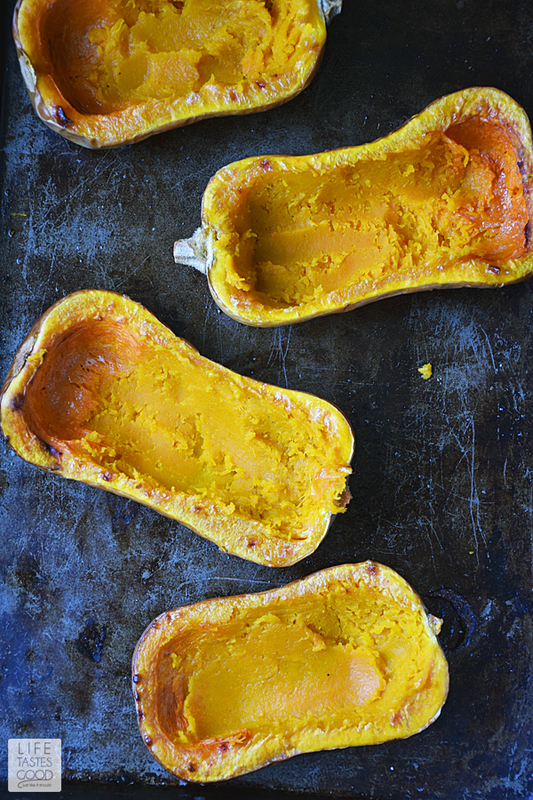 Melt 1 tablespoon unsalted butter and brush a little on each squash. Sprinkle each squash with a pinch of kosher salt and roast in the oven for 50-60 minutes or until very soft when pierced with a fork. When squash is nice and soft, remove it from the oven and allow to cool. Scoop out the inside, leaving a nice border all the way around. I use the open end as a guide and scoop out enough squash to make it even end to end. Reserve the squash you scoop out to make a wonderful dessert such as my Butternut Cheesecake or Oatmeal Butternut Squash Cookies. While the squash is roasting, prepare the rice. Melt 2 tablespoons unsalted butter in a large skillet and add 1 cup Basmati rice. Cook the rice until lightly toasted and add 2 cups of broth. I use chicken broth, but vegetable broth works fine if you prefer. Bring to a boil, cover, and reduce heat to low. Simmer for 15-20 minutes until most of the water is absorbed. Remove from heat and rest for 5-10 minutes, covered. Spoon the rice mixture into the squash bowls to fill. Try to divide it evenly. Depending on the size of your squash, you might have a little rice mixture leftover. It's great for enjoying in a wrap for lunch the next day or even another dinner with a salad. Top each stuffed squash with a tablespoon of shredded cheese, or more to your liking and bake in the 400°F oven until the cheese is melted and everything is heated through, about 15 minutes. Remove from oven and serve with sour cream and my homemade Simple Guacamole. Enjoy! Cook time: 1 hrs. 00 mins. Total time: 1 hrs. 15 mins. Maybe that's the key---not telling Bill it's meatless! 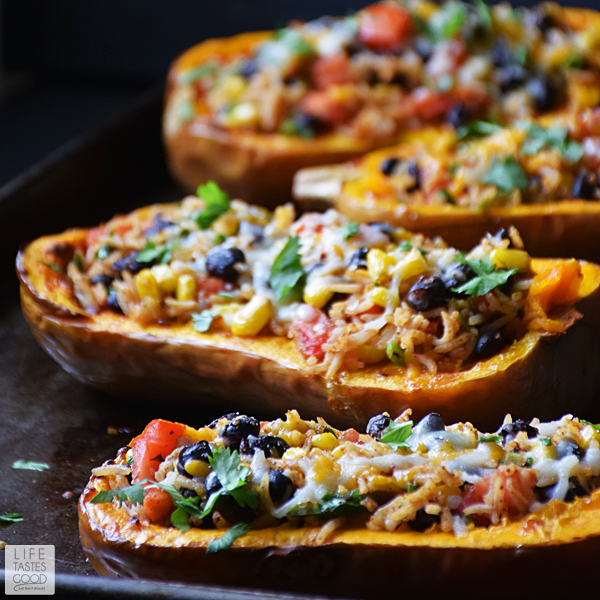 I'm loving your southwest inspired stuffed squash! It looks fabulous! This is such a hearty meatless meal. 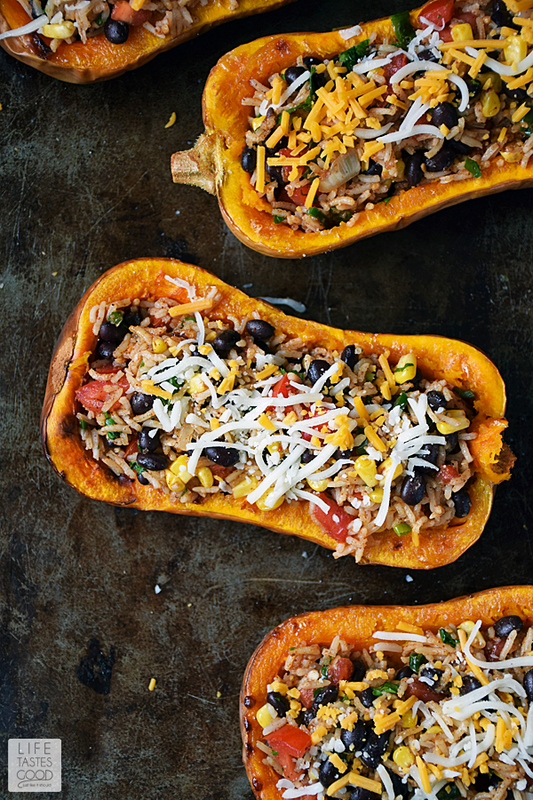 Loving all the butternut squash recipes today! So pretty, Marion! I love this flavor combo. Yeah, I wouldn't miss meat in this dish either. Sounds flavorful! 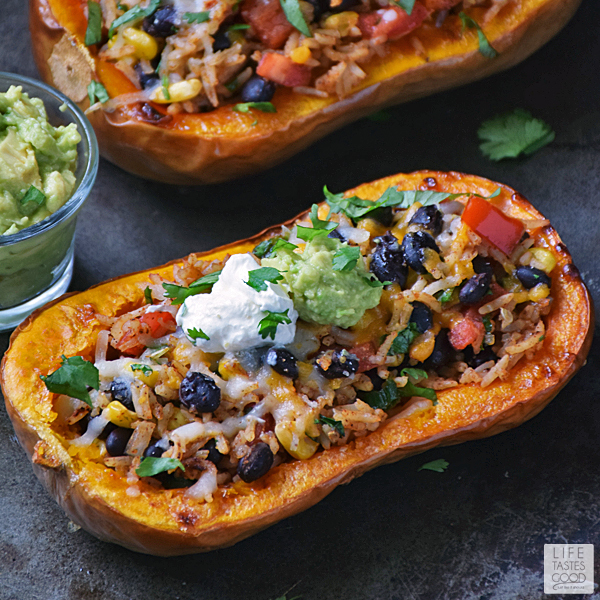 Your squash looks absolutely delicious, definitely a hearty and tasty meatless meal. This looks so delicious and hearty! Oh, swoon. 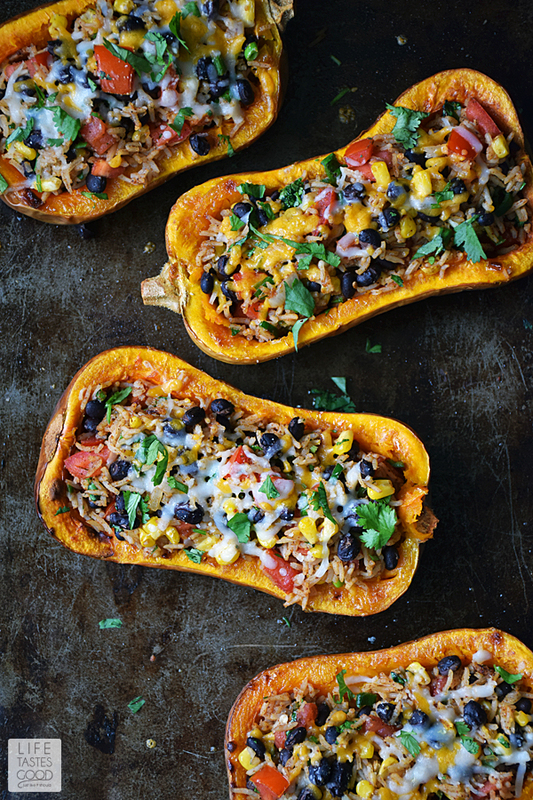 Squash goes so well with tex mex flavours, this looks wonderful! This looks absolutely delicious! So much goodness stuffed in an edible bowl! I am obsessed with butternut squash and will definitely be added this to my "must make" list. Thanks Marion! You and me both, Teta! Butternut Squash is my fave! I hope you love this recipe as much as we do. Thanks and have a great week! Wonder how many calories it has? Made this last night... So GOOD! Wonder how many calories are in it? Is there a printable recipe? I can't seem to find anything to click on. Thanks. Please share how the Chorizo addition turned out! I would love to add this as well but, afraid it might be too oily! Holy cow. This is so delicious. I just made this and my husband and I LOVE it. The flavors are excellent and I didn't use any salt- just the spices (and low sodium veggie broth for the rice). My stepdaughter has been staying with us and as she's a vegetarian, I've been trying to find recipes that suit both her and my carnivorous husband. This was a bit hit at dinner tonight. Very substantial meal all on its own. I substituted the white basmati with some brown rice and sauteed red onion and fresh garlic to add to the wonderful filling. I will definitely be making this again. Hi Jaime, I'm so glad you enjoy the recipes :) that makes my day! At this time, I don't have a print option as it is time consuming and costly for me to offer that. If you email me I am happy to send a printable version upon request. I do write my recipes so they are easily followed on any device by including the measurement amounts in the directions, but if you prefer it printed just let me know via email to life_tastes_good@yahoo.com Thanks!